With degrees in law (LLM – London School of Economics, LLB – University of Kent and Barrister at Law – Gray’s Inn, UK), Ayesha Tammy Haq is a Barrister-at-Law and, more recently, a media personality. She has practiced law in the UK, Pakistan, the Philippines and the USA and has worked on several international projects in particular power and telecom. Her area of expertise is project development and finance. Tammy hosts 24seven, a current affairs talk show on Business Plus, where she has not just interviewed presidents, prime ministers and political leaders but those who advise on and formulate policy. She also writes opinion pieces for several newspapers and publications and hosts a radio show on FM89. Tammy currently sits on several boards, advisory committees and task forces and was a member Pakistan’s 5 Year Plan working group in 2004. A civil rights activist, she is involved with human rights and other rights based organizations in Pakistan. 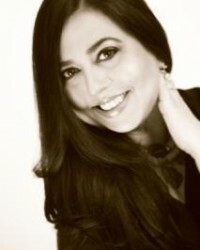 She has been CEO of Fashion Pakistan, the Fashion Design Forum and organized Pakistan’s first ever fashion week, Fashion Pakistan Week, in November 2009. Tammy enjoys traveling and her varied interests include scuba diving, skydiving, hot air ballooning, dance and pottery.